I have always been a very active person. I started weight training when I was 22. At that time in my life I loved it, but looking back I’m pretty sure it didn’t do my joints many favours. Seven years ago I discovered my true love, climbing! However, I found that my body builders physique actually hindered my climbing, and still does to this day – enter Bikram Yoga. To help bridge the gap between my body building and my climbing, I thought yoga might help. Little did I know how much more Bikram yoga would bring into my life! I was hooked! When I first started Bikram yoga, I took full advantage of the introductory offer (£40 for 30 consecutive days) and was trying to make class 4 or 5 times a week. I’ve tried many things in my life but nothing compares to the feeling after a Bikram class: the relaxation and happiness each class brings (after the suffering), have kept me coming back through the doors, for the last 7 years. 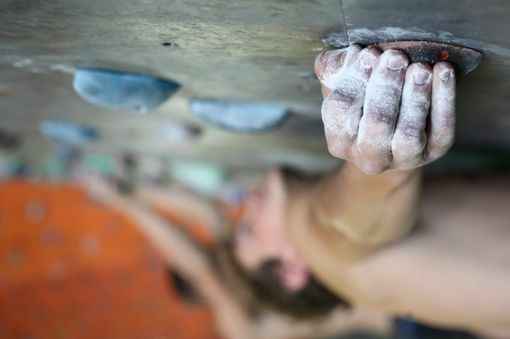 Around 4 years into climbing, my elbows started to give up on me and I developed climbers/ tennis elbow. For those of you who have never suffered with this, all I can say is, it hurts! It makes even small day-to-day chores very painful. I spoke to the teachers at BYC and they recommended that Locust Pose might help. So, for 2 minutes everyday, I lay on my elbows in Locust. To begin with, I took the posture back to basics, putting my arms underneath my body and just laying on them. Once the healing had started, I began to bring my legs up again. 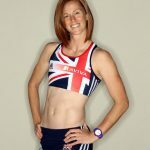 Within 6 weeks, my elbows had started to recover and, within the year, were fully recovered. At the first sign of pain, I now know what to do: Locust all the way! Not only has Bikram yoga healed this and endless other injuries, it has provided me with a sense of well-being and new direction in life. Just get in the room! I promise you won’t regret it. And, if there is one thing I could say to all of you new Bikram yogis/inis, it would be: make the most of your introductory offer, come as much as you can, and the rewards will be endless. For cases like Garry, we encouraged him to continue with Locust pose, bringing his arms in and underneath his body, but not lifting his legs. To begin with it, this can be somewhat uncomfortable. That’s because the stretching and strengthening that happens during this posture, is what eventually can correct this kind of problem. You have the weight of your body and the correct position of the joints and muscles, which aid the stretching, with the added support of the floor. When you bring the legs back into the posture, you are strengthening your whole upper back, shoulders & arms (as well as your legs & buttocks). As an added bonus, the compression happening to the joints of your arms, temporarily restricts the blood flow to them, acting almost like a dam. Then, in Savasana, with the release, the blood flushes with more impetus through wrists and elbows, helping get rid of scar tissue or other injuries. 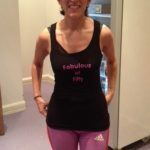 Next Testimonial Emma: Totally Fabulous at 50!